The "Nord Modular G2 series - Vol. 01. 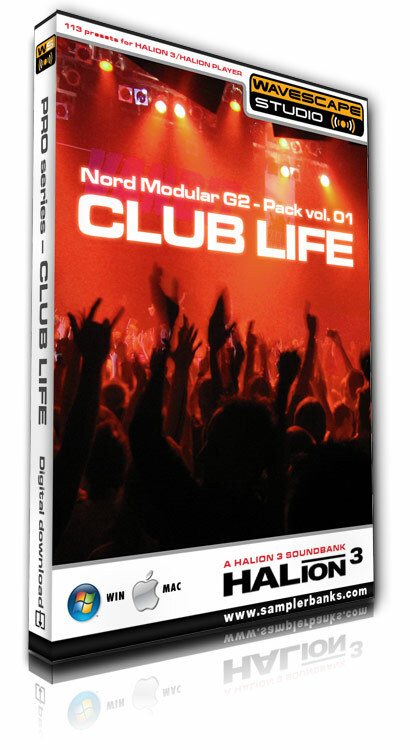 - CLUB LIFE" is a set of 113 magnificent multi-sampled and categorized instrument collected into a HALion 3 soundbank, using all the great features of your Steinberg HALion 3 sampler. Shaking basses, dark pads and swirling arpeggios, cutting-edge leads are all there to add a distinctive character, to make your mind blowing and your production shine. This heavyweight compilation rocks on the dancefloor, however we did not focused on re-creating the overused "hard-trance"-like sounds, instead we made sampler presets that matches of descriptive attributes, like "sizzling, warm, sharp, nasal, fat, emotional". Its dense and evolving esoteric layered landscapes makes this compliation also suitable for film and post-production works, but its primary usage is for music production in trance, dance, pop, house, techno, electro, psy, ambient etc. genres. The sound designers of Wavescapes Studio spent lots of time just for creating G2 sounds that really works, then recorded and processed these sounds as multisamples in 24 bit format. Sampler presets are carefully keymapped, programmed and fine-tuned using all relevant HALion 3 parameters (including DCA, DCF, LFO, modulation matrix, glide, etc.) manually. Realtime control possibilites are also added: just move the modulation wheel to change several parameters in real-time in order to make sound breathe! Sampler presets in this pack went through a multiple selection process, so 113 real club sounds were selected from many hundreds. Some of them contain massive layers creating really FAT sounds - just check the XTRA category! We categorized each presets into ARP, BASS, LEAD, PAD, XTRA categories for easier identification while looking for the right sound for your song in the making. Finally we compiled the sounds into a single HALion 3 Bank format (*.hsb) file, so you do not have to worry about missing samples anymore.